Mersin Arena or Mersin Olympic Stadium is a multi-purpose football stadium located in the south-central Turkish city of Mersin. Constructed for the 2013 Mediterranean Games, the 25,534 capacity ground is now used mainly for the football matches of Mersin İdmanyurdu SK. Mersin Olympic Stadium was constructed as the centrepiece of the 2013 Mediterranean Games. Predominantly been used to host the football matches of Mersin İdmanyurdu SK since the conclusion of the tournament, the inaugural game was played against Gaziantep B.B on the 23rd March 2014. Costing an estimated 100 million euros to build, the stadium sits within a wider sports and recreation centre which is comprised of restaurants, shops and gyms. Originally the plans stated that Mersin Arena’s capacity would be anywhere between 30,000 – 33,000 however it was eventually completed with a scaled back capacity of 20,667. After the climax of the Mediterranean games, the seating configuration was adapted in order to make it more appropriate for football matches. Additional sections of seating (~5,000) were added on top of the redundant athletics track, and thus a final capacity of 25,534 was achieved. Along with Galatasaray’s Türk Telekom Arena which first opened in 2011, Mersin Olympic Stadium is currently one of the most modern grounds in Turkey. It is another example of a stadium built for the Mediterranean Games being re-purposed for football after the ones in Almería and Pescara. 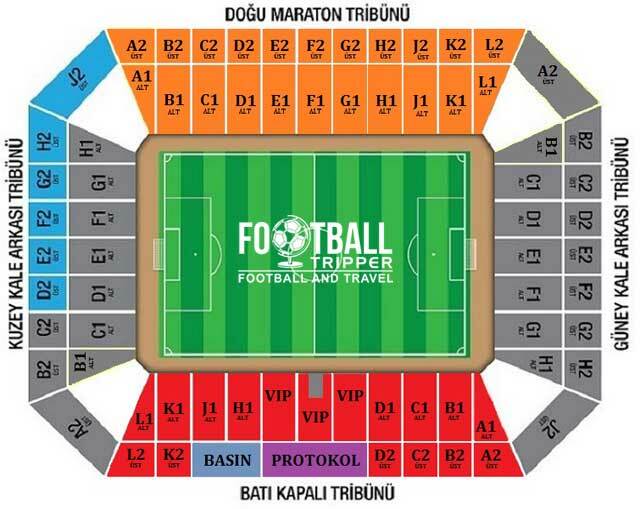 Mersin Olympic Stadium is comprised of four stands: North, East, South and West.